Website Conversion Secrets: How To Make Your Website Sell Like Crazy! "What If I Told You That You, Yes YOU Can Increase Your Profits by 100, 200 or Even More Than 1287 Without Working Any Harder? Would You Let me Show You How To Do It?" Extremely Urgent! Click here now to print this page and then keep reading this time-sensitive message! * The one common online practice that can easily backfire and actually cost you sales. You will learn how to do this the right way so that you make more profits. * A dirty little trick "stolen" from offline copywriters and how to adapt this to your website. Do this correctly and the visitors will be so involved in your site they won't even think of clicking away! * The 11 points you can't afford to ignore if you want your site to have any semblance of credibility. It's simple: Lose your credibility, lose the sale. You will understand how to do this correctly. * What can you learn from newspapers? Grasp this concept and the conversion rate of your site can increase by more than 114! You will laugh once you see how easy it is. * Finally analyzed: Should you mention the "technical" features of your product in your web copy? Or not? And why? It may not be what you think it is. * An amazing powerful trick to skyrocket the number of people who actually read your salesletter! This can instantly double your profits and you can implement it quickly and easily. * Joseph Sugarman in his book "Advertising Secret of the Written Word: The Ultimate Resource on How to Write Powerful Advertising Copy" gives his suggested outline for writing advertising copy. Do you know what it is? Ewen, "Website Conversion Secrets" is a great, no fluff, hard-hitting checklist for increasing the conversion rates at any website. I made a ton of notes as I read it... things to test and adjust on my sites. It IS the little things that make a difference, and when the cumulative effect of making a lot of positive changes is added up, it can be astronomical. Your book offers a laundry list of these things to look at in improving the website's structure as well as supercharging your ad copy. aking money online is simple math. If you want to double your sales, try doubling your conversion rate rather than your traffic. If for every 100 visitors you receive to your site you make 1 sale, then you have a conversion rate of 1. But, what if you could increase the conversion rate of your site? What if you could "convince" just one more person to take you up on your offer? Then your conversion rate would jump to 2 and your profits would instantly double! * A service that allows you to locate slow loading graphics and bad links on your site...and where to get it for free. * The one thing you have to keep in mind every time you create a website. (Hint :not everyone sees things exactly as you do). * What type of fonts should you use online? And why? What can you learn from direct response offline marketers? * Should you use Flash presentations on your homepage? Or not? And why? The answer may surprise you! * Explained: The concept of "themes" in your website. What is the importance they play in your conversion rate? * The 4 'little foxes' that can spoil the overall professional appearance of your website. Are you sure you are not making one of these mistakes as we speak? * The common temptation that many companies fall into when creating a website...and why it can spell disaster for you. You will learn how to avoid this fatal mistake. * What style should you use when "talking" to your visitors? Formal, informal or what? And why? So many people make this mistake it's not even funny! * Should your salesletter use correct grammar? Or not? The answer may surprise you! * How to answer common objections your visitors may have about your product or service. Be careful here. If you leave even one question unanswered, you could lose the sale and it would be a crying shame. * Are you sure that all your visitors want to save money? Or maybe there's something else you should aim at as well? Few people use this method but now you will be one of them. * A technique used by computer manufacturing giant Dell. The beauty of this is that you don't need Dell's millions to do it. You can do it as easily for free! * How to use this aspect of human nature to increase your sales even more! This is true almost 100 of the time... even if nobody admits it! * A strategy "borrowed" from the world of direct mail marketing. Along with the usual salesletter the mail order company includes something else in the package as well. What is it? And... how can you do the same on your webpage? * Pop ups: Do they work? Or not? Are they the most hated concept online? And, if yes, why do so many marketers who make thousands of dollars every month use them? The truth finally comes to light! * How to break up big decisions into tiny steps... and why it's critically important to be able to do so. Get this right and you will increase your profits even more. * How to use anchor tags to guide your visitors through your presentation and make it easy for them to give you their money. * A little secret to differentiate yourself from your competitors... even if you sell a product of exactly the same quality as they are. * How you can charge 5 times more for the exact same information... and your customers will be ecstatic to give you their money! * How knowing how to handle existing customers can mean some of the easiest money you made in your entire life. Why so few people do this? Beats me! It's 100true. As a matter of fact, some copywriters have admitted in public that they make a lot of money without having a clue about "search engine optimization". However, even their competitors are happy to send them their subscribers because they convert so many of them to paying customers! * The power of post scripts in your webs copy. Harness their power and watch out! * Explained: The concept of the "by the way" technique and how to use it in order to generate even more profits from your website. * Analyzed: The "AIDAS" formula. How this strange word can mean untold profits for the few people who truly understand it. * The ad copy style recommended by John Kennedy (he charges up to $50,000 for a salesletter). What could you do if you knew it? * The power of "bullets" and how to use their power to volcanically erupt the conversion rate of your site. * Should your products be cheap? Or expensive? And why? Where does the truth lie? * How to change your general statements into specific ones and why this little secret can virtually skyrocket your conversion rate. * The technique of "limited quantity offers" and why it's so powerful. Few people use (or understand) this concept. * The two main emotions that top copywriters aim at awakening. Do you know what they are? * The one point of your presentation where you should really "give it all" and why it can mean you getting the sale instead of your competitors. * How to ask for the order. Should you use multiple order options? Or not? Many people give the exact opposite answer of what they should in the above question! * How to strike your maximum profit point by using this advanced technique. This technique is used after you have finished your salesletter. o you have any idea how much a good copywriter costs? If you "shop around", price tags of $10,000 to $15,000 for one salesletter plus 5-10 royalties on gross sales generated are pretty common. Stunned? Well, actually you shouldn't be. 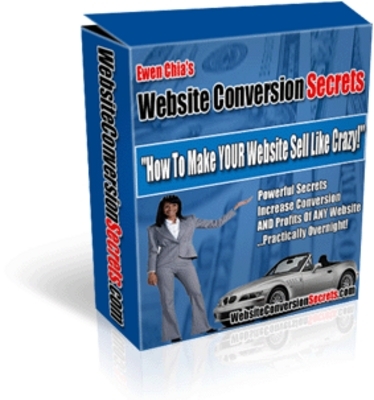 Ewen, "Website Conversion Secrets" is another pleasant surprise from you! It's nice to see solid information in a format that any marketer can easily read and follow, to get good base foundation on web copy. It's an absolute must for all beginner marketers! But you know what the best part is? Even a top notch copywriter can get you lousy results! Yep, you read that correctly. Even if you hire a professional copywriter, your sales can be zero. Ewen, this ebook was just what I needed! I've read quite a few copywriting courses, but most of them left me feeling overloaded with information and unsure of what to do next. It Gets Better Still -- You Don't Have to Decide Today Because Your Success Is 100 Backed By My 90-Day Money Back Guarantee. I'm convinced that no matter how long you've struggled until now, no matter whether you are a raw beginner or an old pro, this manual is going to change your ability to create sales generating sites forever! I know, I use these techniques all the time. I believe in these methods so strongly, that I'm willing to put my money where my mouth is. I personally guarantee that if you make an honest effort and use any three of the techniques in this manual on your site, you'll at least double your sales in the next two weeks. That's right, sales you never would have seen without these techniques. If you don't, I'll refund the entire cost of this entire package to you and we will still be friends just for giving me a chance to show you what this package can do for you. Plus, as a token of my appreciation for you I will let you keep the manual. That's right. You don't have to send anything back. I won't even ask you to delete it from your computer. You can have it handy whenever you want and refer back to it time and time again... with my blessings. I'm that committed to your success and I absolutely refuse to have customers less than 100 satisfied. Look...You Can Even Make Money With This! Since you have read down to this point, I know something about you. I know that you are serious about increasing the profits of your website. That's why, with your permission, I would like to give you a gift worth a very real $197. Download your own copy of the manual and I will also give you Master Resale Rights to the entire package! This means that you can resell this same package for 100profits and even allow others to do the same. Of course, you will get a professionally written website as well to help you sell the maximum amount of copies and keep 100 of the profits. Imagine: Your very own product with a ready website that you will be able to start profiting from within minutes after you download your manual. Urgent Update: Don't wait another second as I may just pull off the Master Resale Rights license (worth $197) anytime. If you check, my basic resale rights alone are sold for up to $197 at Mini eBook Secrets and Resale Rights Secrets, so this is simply a no-brainer deal! Yes Ewen. I want to own a copy of Website Conversion Secrets. I understand that this is a risk-free trial invitation and I'm absolutely under no obligation. I can try the manual 100 risk-free. I understand that I will also get master resale rights to this package complete with a copy of this website so that I will be able to resell it and keep 100 of the profits. On those terms, yes, I'm clicking the button below because I want to experience what it feels like to be able to create a site that pulls orders like crazy.